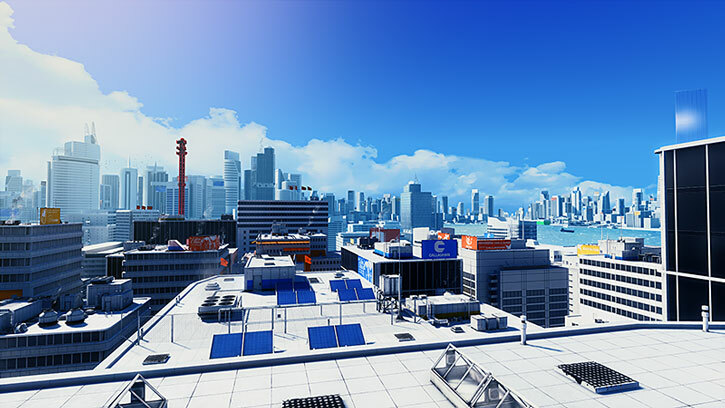 Mirror’s Edge is a fan-favourite video game, released in 2008. 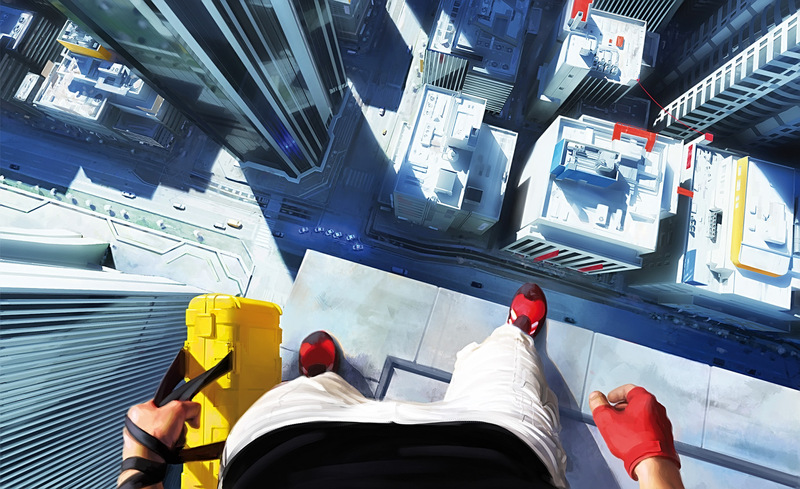 Its main strengths were its visual and architectural design, and playing an urban acrobat in a first-person perspective. Though the game itself doesn’t present it clearly, the heroine and the setting are also intriguing. Our profile only covers the original game. 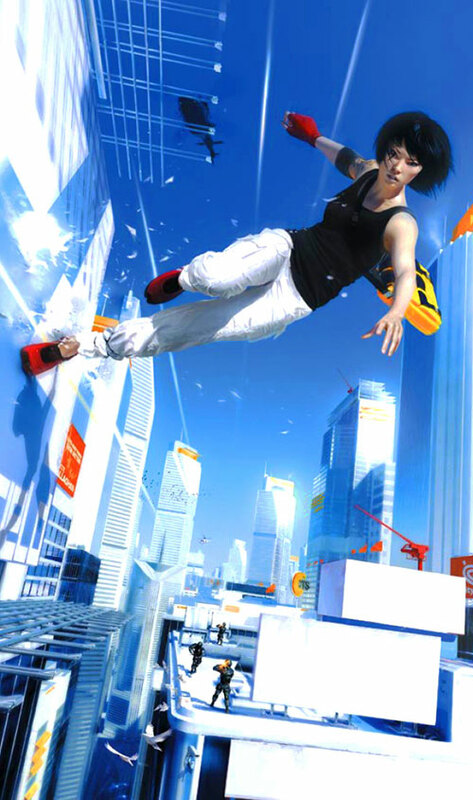 It was done well before Mirror’s Edge: Catalyst. 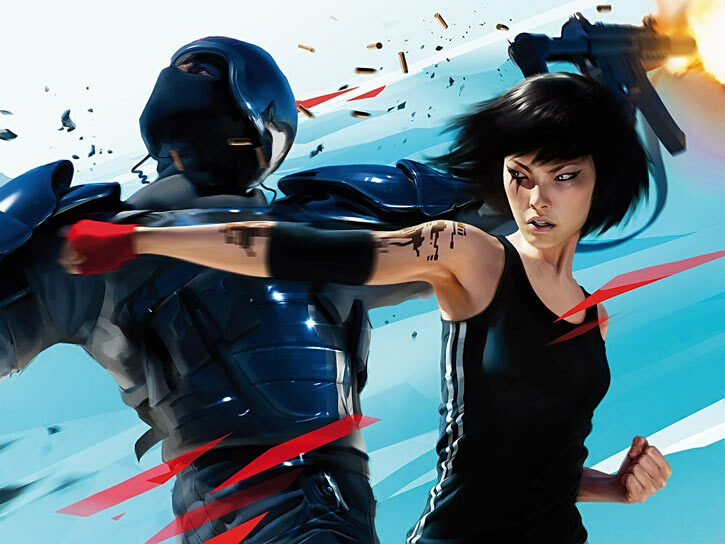 We later added a banner showing Faith’s subtly different design in that 2016 game, though. The entry avoids most S P O I L E R S, but is not entirely free of those. Other Aliases: “Effie” (nickname used by her twin). Known Relatives: Kate (twin sister), Erika (mother, deceased), Abraham (father, deceased). Group Affiliation: Partner of Mercury ; the Runners. 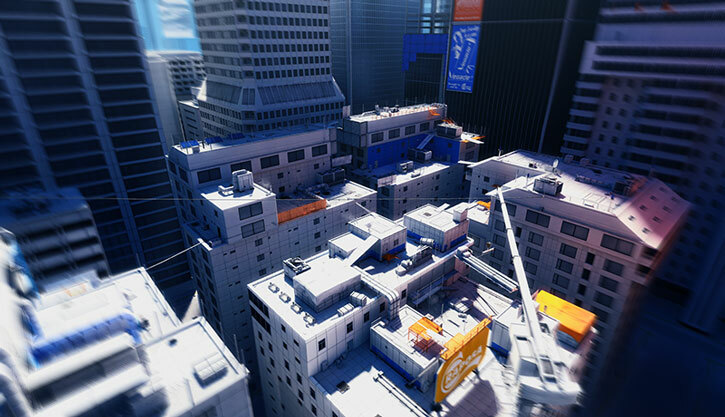 Base Of Operations: The City. 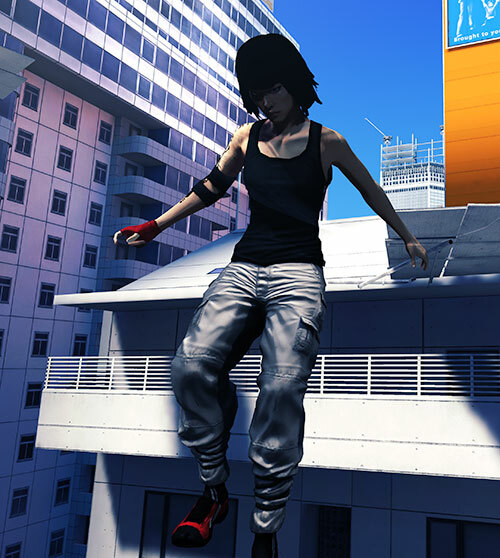 Faith is a world-class traceuse (parkour free runner) and acrobat, with excellent hand-to-hand combat and stealth skills. Her endurance, strength, precision, running speed and reflexes are way above average. Chasing Faith across the urban landscape is nearly impossible. 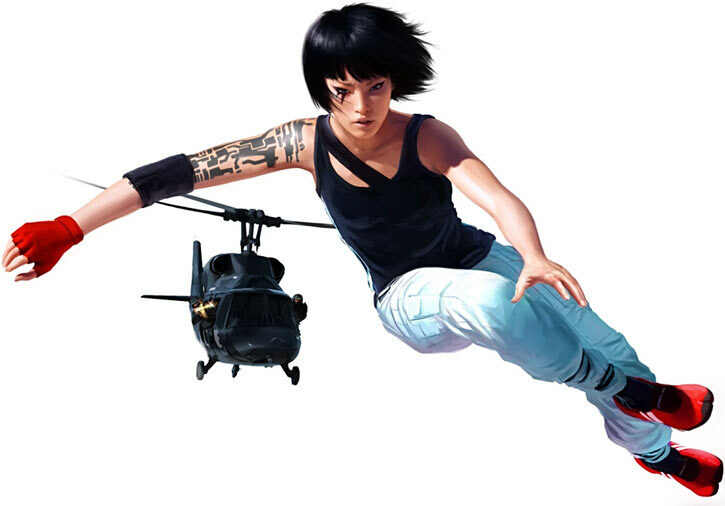 Even with several squads, weapons free and an helicopter, intercepting her has abysmal chances of success. Her running smoothly flows into numerous leaps, slides, technical rolls, passements, wallrunning, rapid climbing using pipes and walls, reverse vaulting, tic-tac wall-bouncing, muscling up and shimmying when there are only hand holds available, sauts de chat, etc. Faith has no fear of heights whatsoever. She is perfectly comfortable doing acrobatics 50 stories above the pavement. Once in motion she’s an exasperating and unpredictable target with a good sense of cover, and the odds of hitting her are dismal. However this has its limits. If there are enough bullets in the air even Faith is at risk. In DC Heroes terms, her opponents can and usually do Team Attack if the situation allows for it. She knows this, and will not engage teams of shooters. She is smart, determined and fearless. Though she isn’t the most talkative person around she has a superior presence that gets people talking to her when she needs. Faith also has access to some of Mercury’s equipment at his place. This includes police radio frequencies scanners and extensive cartography databases for The City. With Mercury as her handler, she’ll receive over her in-ear radio a constant flow of accurate information about police deployment, escape routes, the floorplan of the building she is in, etc. She is also highly computer-literate. But Mercury is usually the one handling this stuff since she’s the field agent. Connors’ fighting style is unrevealed. But it might be a form of wushu, given her acrobatic form. She doesn’t have the body mass to slug it out (she needs to be particularly lean to conserve her power-to-weight ratio), and thus primarily resorts to kicks, trips, sweeps and throws. Besides her goal isn’t normally to beat people to a pulp but to neutralise them long enough for her to get away. Coupled with her lightning-fast reflexes, her bare-handed disarming techniques are impressive. Waving a gun in Faith’s face will usually result in Faith holding the gun a split-second later. She doesn’t like firearms and seldom shoots the guns she takes away from opponents. She might use it as a club or stick to bash the person away, or fire suppression shots to force opponents to cover. But generally she’ll just throw the ordnance away. Still, she’s obviously fully trained. Faith once snipes a moving van with a .50 BMG Barrett M95, which isn’t a trivial skills set. It is possible that Mercury is ex-military and provided this training. Runners prepare their turf. 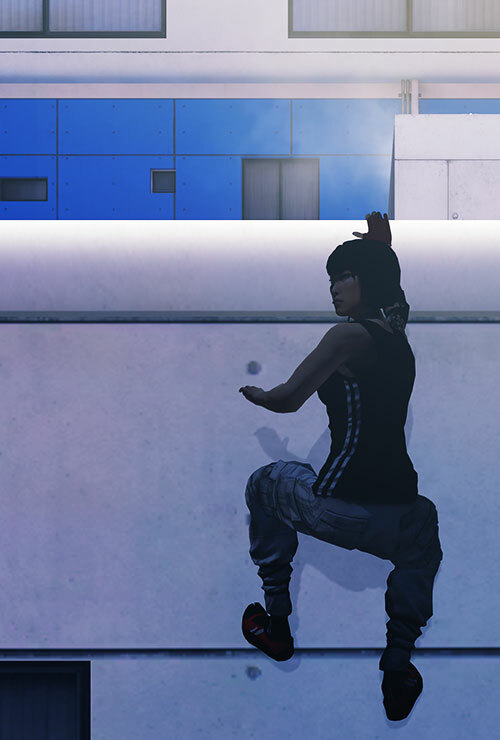 The City is quite parkour-friendly due to its dense architecture, but every little bit helps. Ramps to vault large gaps (usually looking like random planks left on a roof by construction workers). Large holes through chain link fences to make certain roofs accessible. Conveniently-placed crates and other innocuous goods that can be used to kick off high jumps. And even ziplines (easily disguised as ordinary cables) and large mats to drop from elevated points. Connors burns a lot of adrenaline during her runs. As a result, she often experiences a “bullet time” reaction when she performs technically demanding moves, particularly in combat. In DC Heroes terms, this is DEX and Lightning Reflexes plus Martial Artist and her Schtick. Her usual running speed (about 30km/h), while pretty fast, isn’t Olympic material. She’s an acrobat, not a sprinter, and has to carefully manage her endurance and breath. On the other hand, and for the same reason, her acceleration from an immobile start is lightning-fast. Faith is good at using her environment in a fight. This ranges from improvised weapons to using walls to bounce off on and deliver flying kicks without telegraphing them. The actions performed by Faith in the game are superhuman, or at least highly cinematic . This is not uncommon in video games — see our Fallout 3 sample Lone Wanderer for an example — and thus our DC Heroes stats assume that the superhuman aspects to her techniques are simply a genre convention, to be reflected by superior Skills and Attributes. This is mostly supported by fellow Runners and ex-Runners, such as Celeste or Jacknife, performing similar exploits. Friction Control to neutralise damage when using sliding techniques over dozens of metres, using ziplines with her bare hands, etc.. Friction Control to augment her stickiness to surfaces when climbing, notably along vertical piping, and wallrunning longer than she should. Gravity Decrease is an option to make certain jumps possible, particularly turn vaulting from an immobile start toward a higher hold or surface. However, friction control could explain most such manoeuvres by increasing the friction between her feet and walls, supporting her weight for a second as she coils for her leap. 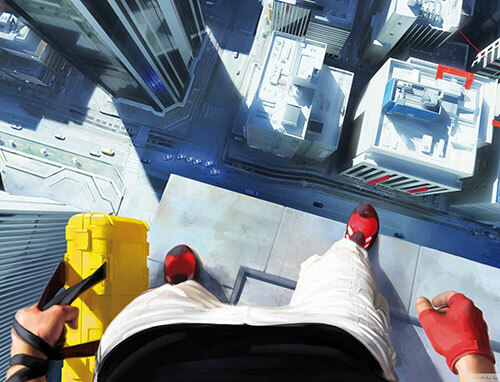 Superhuman jumping ability is necessary for some scenes (such as the finale) if you do not go with the gravity control route. Increasing her durability toward impacts to represent her ability to soak falls and gunshots within certain limits (in DC Heroes terms, Skin Armour). An even greater power of Regeneration. 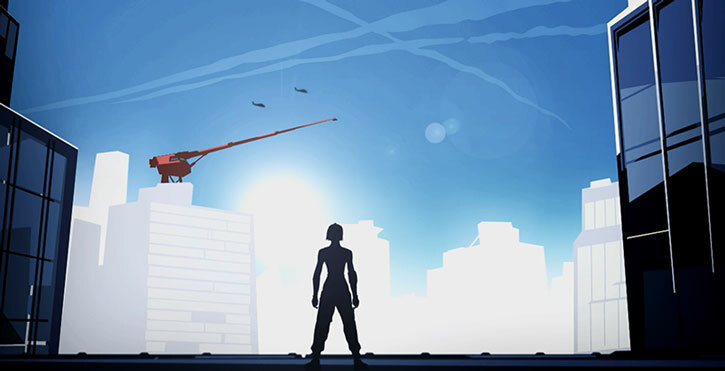 Our game stats already include a significant healing factor, since her ability to ignore and recover from gunshots during the game exceeds what can reasonably be explained by genre conventions, or even the usual hand-waving such as the impacts actually being shrapnel from nearby surfaces after a near-miss. 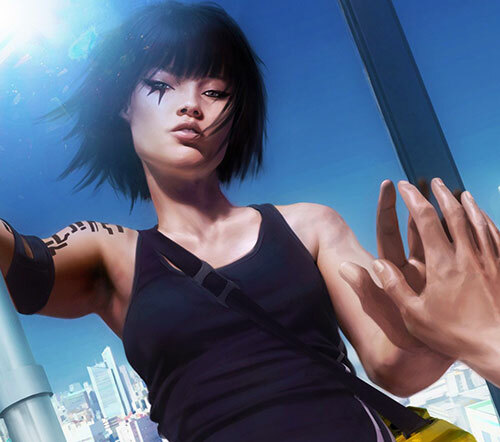 Though the gameplay doesn’t feature B&E skills in order to focus on the acrobatics, it is likely than in a less streamlined storytelling form Faith would have to have more developed lockpicking and security system skills. 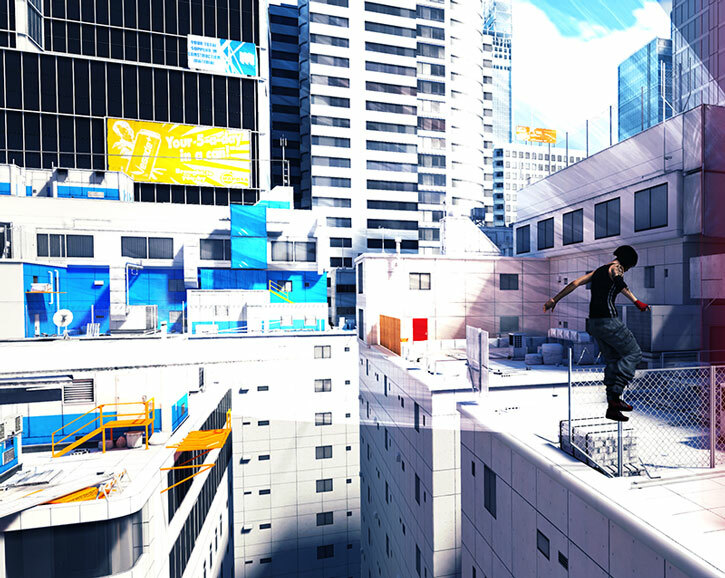 In the Mirror’s Edge genre, parkour/free running techniques play a role not unlike kung fu in wuxia tales. Knowing them makes you much tougher than ordinary people, and a master of the art will be essentially superhuman. If thugs get taught parkour, they’ll graduate to being ninja-like thugs. 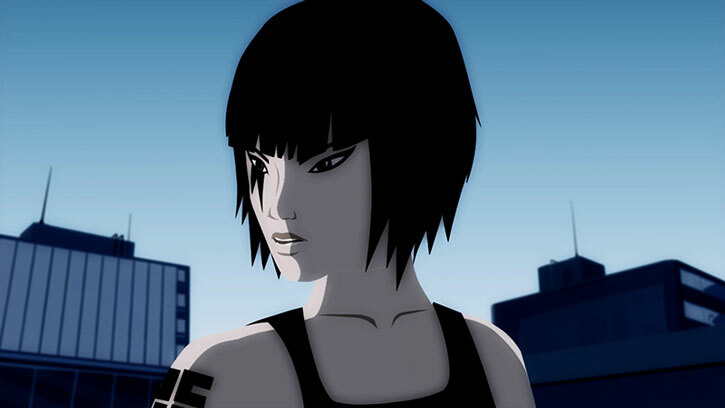 Many of the narrative animé sequences in the game, including the flashbacks. 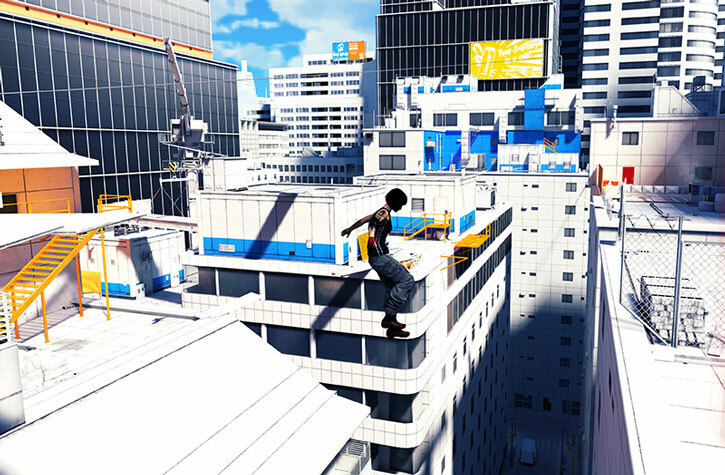 Action footage from the game, including the one used in the trailer above. 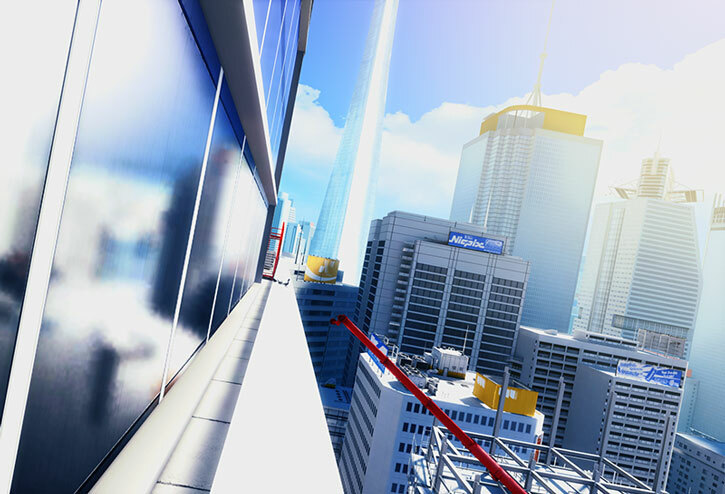 The background of Mirror’s Edge is kept vague. Thus, the setting is only known as The City. It seems to be a loose mix of Singapore and Vancouver, with most of the adverts and signs in English and a pleasant weather. The date is never specified and even the totalitarian regime at the heart of the story doesn’t have a name. The City used to be a diverse metropolis in an international style, apparently in the late XXth century. However, the government gradually developed an intrusive surveillance regime with phone taps, cameras, data monitoring, metadata mining and increasingly widespread and frequent police controls. This went along with increasing privatisation of governance. 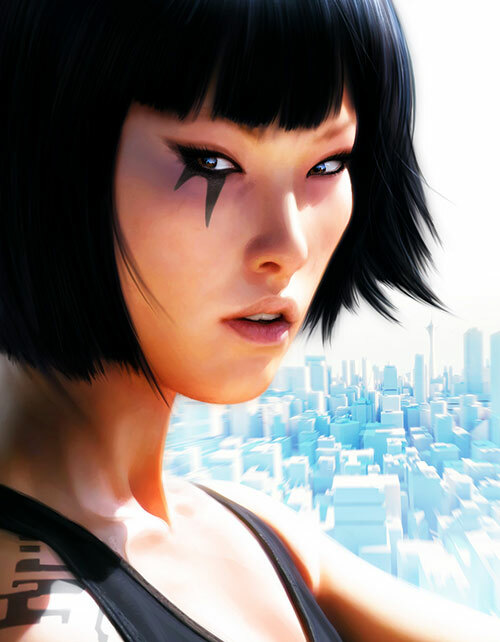 By Mirror’s Edge time the private security firms have more political heft than the police. Much of the population was apathetic as the economy was good and they believed the promises of total safety. However, one Dr. Abraham Connors objected to the rise of the surveillance state. He joined a large political movement called Libertas. Libertas became a crusade for him, and he threw his entire life and savings in the cause. The large protests organised by Libertas eventually went wrong and ended in riots. As always the responsibility for these was murky. This led to a full police response that crushed the movement. During one of the incidents, Erika Connors, an electronics engineer, was trampled to death. This death broke the family. Blaming himself for having dragged his wife into the cause, Dr. Connors sunk into depression and alcoholism. He gradually stopped coming home. Furthermore he had a major falling out with his close friend Robert Pope, the founder of Libertas. Robert had been having an affair with Erika and blamed Abraham for her death. Faith wandered away from home even before her father did, as she couldn’t bear the absence of her beloved mother. She ended up living in the street. Before leaving she just took a small circuit board her mum had been working on, to keep as a talisman. Meanwhile, The City continued being rebuilt. It was a never-ending project of modernisation that replaced the XXth century concrete with tall, gleaming glass-and-metal buildings. The new, ultramodern City was cleaner and more comfortable than ever. It sported a airy architectural style, with a lot of shiny white and bright primary colours both outdoors and indoors. Though close to cyberpunk themes, the modern parts of the City are attractively designed and evoke prosperity, smoothness and safety. Counterculture types came to dismissively call it “the mirror” since it was so gleaming, and everything in it was visible – the new City doubled as a panopticon, with the controls in the Shard building below the Mayoral office. The older, non-rebuilt, grey concrete areas became home to the lower class, pariahs, marginals and petty criminals. While living on the street, Faith soon had to steal to eat. When breaking into an apartment to steal a television, she was caught by a man called Mercury. Seeing her potential, Mercury unexpectedly recruited her into a tiny subculture called the Runners. Runners are ruggedly independent individuals who prefer to live off the grid – which, in the totalitarian City, is a pretty tall order. This means that they live among the rooftops of The City, where the surveillance apparatus is the thinnest and police intervention is the most difficult. 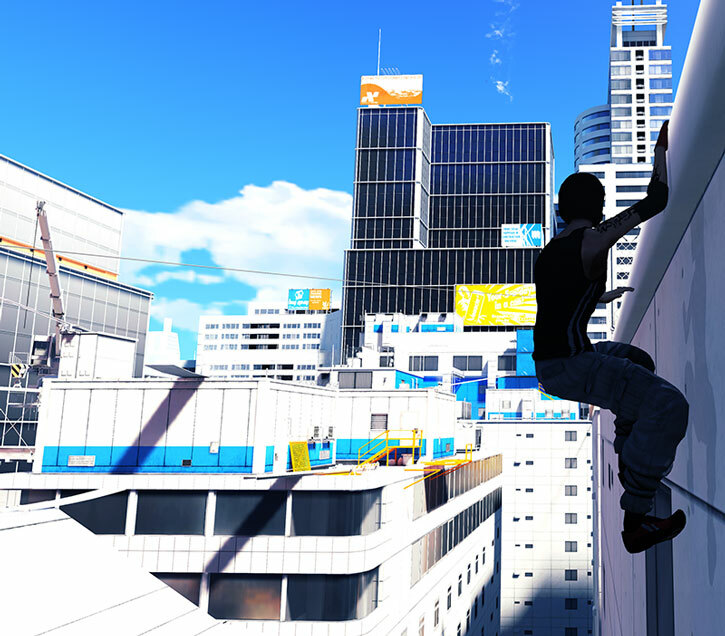 Runners use parkour (PK) techniques for free running among high-rise buildings, and these skills led them to offer their services as couriers. Hired Runners thus transport small packages (often data discs) for shady interests within The City, often based in the older neighborhoods, who want to evade the omnipresent police surveillance. 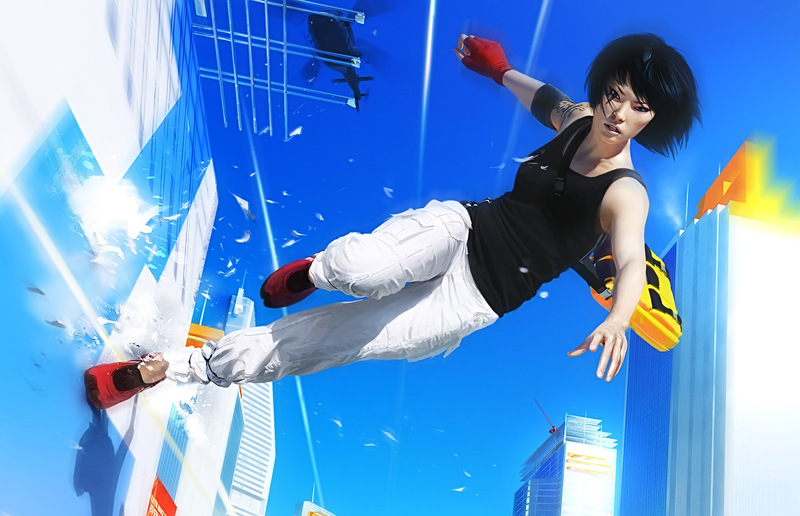 In Runner slang they exist on “the mirror’s edge” – both as a play on The City’s dismissive nickname, and as a metaphor about the only part of a mirror that isn’t a reflection. Runners remain in loose contact for mutual assistance. For instance, if a courier job implies a long distance, two or three Runners might get involved as one carries the package across their preferred turf and hand it over to another Runner to cover the rest. One of them, Drake, is a tech expert and hacker and at least one other, Mercury, now primarily acts as a fixer and connected guy. Faith also frequently works with Celeste, a Runner who’s about the same age as her. One gets the vague impression Faith may have had a relationship with another young Runner, Jacknife, that ended badly. Jacknife later retired from Running, and became a mercenary agent. Faith was primarily trained as a Runner by Mercury as he was gradually retiring. 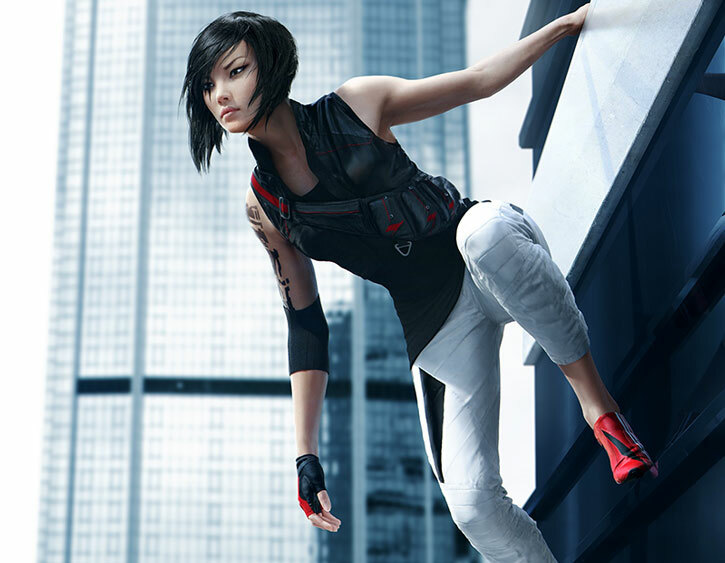 At Merc’s request Faith was also tutored by a woman called Leaf, the primary combat trainer of the Runners. Concerned with Faith’s safety, Merc put her through years of training drills and challenges to make sure she was the best PK free runner around before she started taking courier jobs. Merc seems to be the primary parkour trainer of the Runners – Celeste also seems to have been trained by him. Mercury has an actual obstacle course on the rooftops, though at first glance nothing there seems out of the ordinary. How many Runners are in the City is unclear. Three young field operatives (Faith, Celeste and Kreeg) are featured, plus a retired one (Jacknife). Three older coordinators are seen – Mercury, Drake and (in the comic) Leaf. One gets the impression that there are further Runners and ex-Runners, but one cut scene in the game only shows these persons (minus Leaf) when presenting intelligence efforts to hound Runners. When she was 24, Faith ran smack-dab into her past as she stumbled upon a conspiracy to locate and eliminate her father. As she investigated, she saw her twin sister Kate for the first time in years, located her father and his estranged friend Libertas leader Robert Pope, and learned things about her beloved mother that she would much rather have avoided knowing. She eventually extricated herself from the situation by making a deal with a leading security firm, giving them what they wanted if they left her alone. Connors resumed her activities as a Runner, but a bad fall immobilised her for a time. Mere hours after she had recovered to Mercury’s satisfaction, even more serious trouble occurred. Robert Pope, who had been campaigning for Mayorhood, was murdered and Kate Connors was framed for the deed. Knowing that the life expectancy of cops in the City’s prisons was counted in days, the Runner had little choice to save her twin. She had to move fast to expose the truth. Fortunately, Faith Connors moves really, really fast. A lean, very fit Eurasian woman in her mid-20s. As a Runner, Faith sports a tattoo as her personal symbol (her “tag”). This is two spikes pointing downward from her right eye, which must have been quite painful to ink. 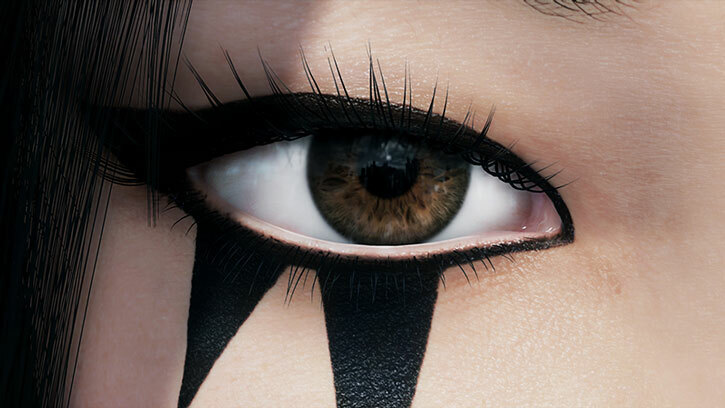 She uses eyeliner to complete her tag by visually anchoring it to her eyes. Her hair is cut in a bob just short enough not to get in her eyes or otherwise impair her acrobatics. Faith almost always wears the same “work clothes” when she’s running – fatigues-type white trousers (which seem amazingly durable to withstand her various sliding techniques), a black tank top, and a distinctive pair of red lightweight running shoes with a separate big toe. 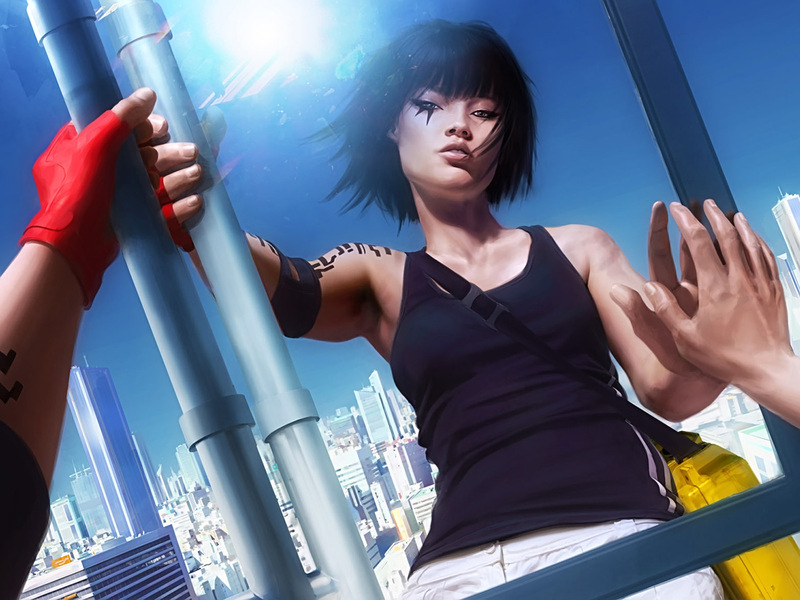 Her left hand sports a red fingerless climbing glove, though her right one is bare (and presumably quite callused). While most Runners have snug, high-tech messenger bags to carry packages Faith still uses a looser, brown leather, old-fashioned messenger bag. Though it is less convenient she insists on having it, as it was her mother’s purse. At 24 Faith had additional ink done on her right arm and shoulder. Though it looks like abstract patterns, it is actually the map of the circuit board her mother was working on at the time of her death. The tat has a sentimental value, but it is also valuable intelligence about a certain police surveillance technology. Though she doesn’t talk much her voice is smooth and attractive. On the other hand, Faith is an intense loner who rarely if ever smiles. In the anime sequences during the game her skin is depicted as very pale, but this is artistic licence. 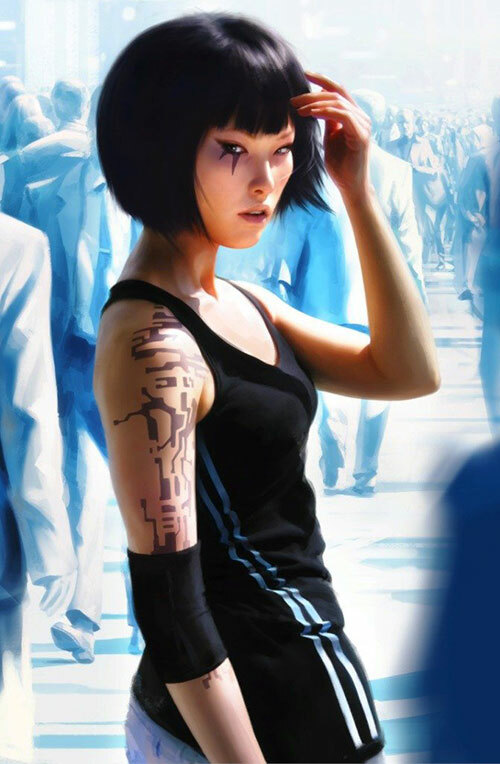 She is otherwise portrayed with an ordinary light Eastern Asian skin tone. Faith is hard, cynical and not terribly communicative. She resents the world for what it did to her, its endless cowardly betrayals, and its constant lies. She wants to be left alone and untouched. Even with Mercury, she remains focused and businesslike. However, he can reliably nag her into opening a bit and telling him what’s on her mind and what she’s doing. However, when Faith does have to interact with people she is articulate, fairly pleasant and surprisingly persuasive. She makes sarcastic comments to Mercury about her supposed lack of people skills, but this is not actually true. 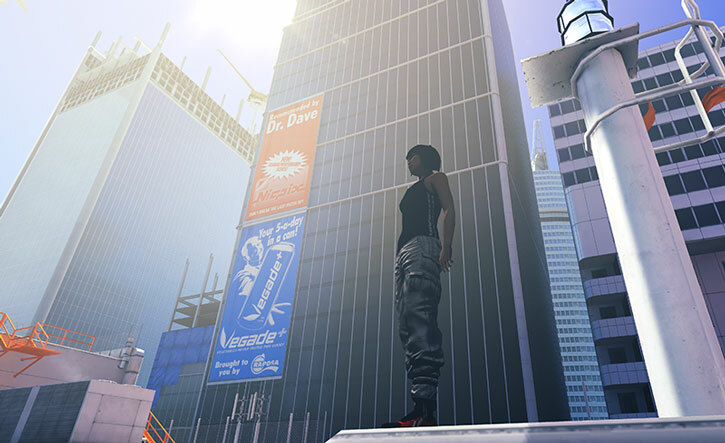 She finds her freedom in action, and specifically solo free-running across the City – her job is her passion. She runs for the thrill and will often be unreasonable, deliberately crossing the path of the police so she can deftly evade them and demonstrate her superiority over the hated “Blues” and the totalitarian order they discreetly enforce. Faith doesn’t compromise much, especially after what happened to her father and what she eventually discovered about her sainted mother. She has a harsh and lucid view of the society she lives in, and considers its social order to be miserable and cowardly. In her opinion, most cops — private or public — in The City are jackbooted thugs. She’s not pointlessly antagonistic about it, but her patience is limited – and she is, as a prominent Runner, considered a kind of terrorist anyway. She’ll cut deals since she’s a pragmatic and reasonable woman rather than a pure idealist, but she doesn’t want to be sucked in by the system like her twin was. 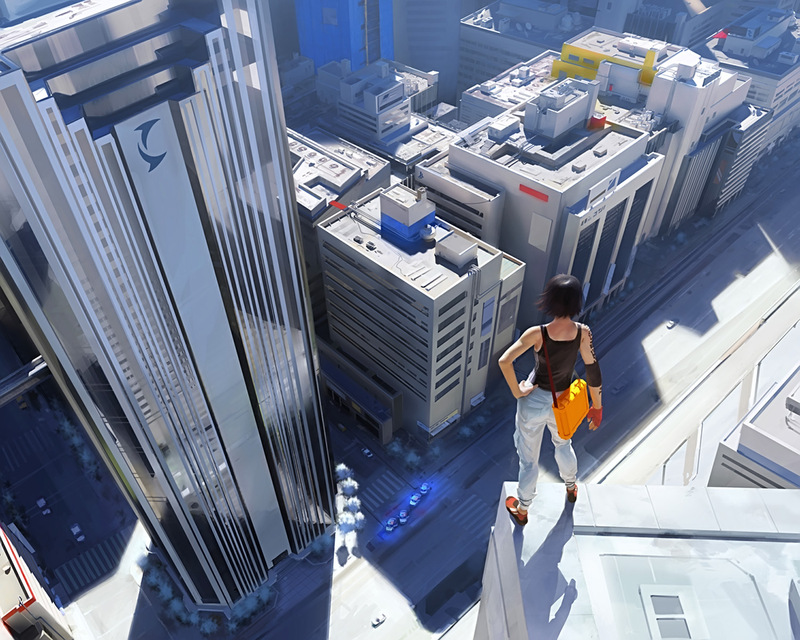 Being sucked down by compromises is one of the core themes of Mirror’s Edge. The heroine (helpfully named “Faith”) remains true to her values and lifestyle as an untouchable thanks to her extraordinary capabilities and resolve, but nearly everyone else has to become part of the totalitarian problem because they need to eat and/or are ground down by being constantly hounded and reviled. Faith doesn’t do tough guy theatre, but she knows how redoubtable she is – and what are her limitations. Trying to intimidate her is definitely not going to work and she’s not going to tolerate it for long. She knows that she’s not invincible either, and her tactics aren’t about standing her ground, but ordinary people aren’t a credible threat for her and she knows it. Connors seems to believe in the original parkour values – no competition, no hierarchy, training to always improve oneself, respecting others and the environment, being responsible and pacing oneself, being honest and helpful. She’s also sensitive to the notions of flow and harmony of movement and lifestyle, and is generally a focused, serious and action-oriented person. Faith strongly disapproves of Kate having joined the police, but despite this Kate demonstrated that she’s more loyal toward her sister than toward the cops. Faith thus agreed to remain in occasional contact with her, though this is still tense and uneasy. Kate looks up to Faith, and treats her as the older sister though they are twins – she’s aware of how much of a badass her sister is. Though “Effie” occasionally gets into her twin’s face for selling out and collaborating with the regime, she knows that it’s stupid on her part and actually loves her sister despite their partial estrangement. Faith’s relationship with Merc has father-daughter overtones, but this seems caused by the age difference rather than any clear intent on either’s part. In various other aspects they are closer to roommates, with Faith good-heartedly putting up with her mentor’s various near-OCD rituals such as eating the topping of his pizzas after letting it age for a few days. Mercury tends to be protective of Faith, but he insists that this is because of all the training he has invested in her as a courier to help with his business as a fixer. Area Knowledge (The City ; Common topology of air ventilation systems), Buddy (Mercury), Headquarters (Mercury’s place), Iron Nerves, Lightning Reflexes, Schtick (Disarmer (Martial Artist)). Creepy Appearance (Runner’s tag), Exile (Runner), Mistrust (Runner). IN-EAR RADIO [BODY 01, Radio communications (encrypted): 08, adds the Floorplans Bonus and the Real Time Bonus to her Area Knowledge provided she’s on comms with Mercury and he has his tools.]. – Immunity 1 (friction damage). Close Attack 2, Defensive Attack, Defensive Roll 2, Evasion, Improved Defense, Improved Disarm, Improved Initiative, Improved Trip, Power Attack, Ranged Attack 2. Benefit 1 (Partner of Mercury), Equipment 1, Luck, Second Chance (fear/intimidation). Acrobatics 6 (+11), Athletics 10 (+11), Close combat (Unarmed) 1 (+8), Deception 2 (+4), Expertise (Runner in The City ) 10 (+12), Insight 3 (+4), Perception 4 (+5), Persuasion 2 (+4), Ranged combat (Firearms) 3 (+6), Stealth 2 (+7), Technology 2 (+4) (Limited 2 to Security). 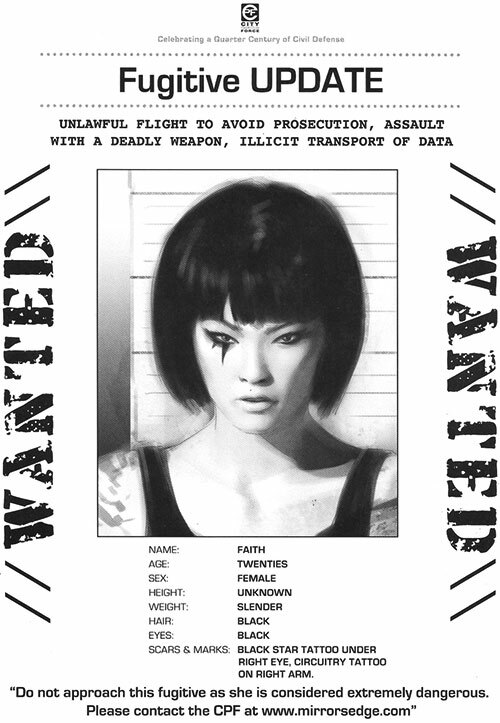 Outcast Faith is a Runner, which is very much illegal – and bears a distinctive Runner’s mark right in her face. Faith and family clause Faith’s dad, mum and twin sister all have/had their secrets and weaknesses that impact Faith. Running free Faith is unreasonably bad at compromising. Gun control Faith doesn’t like firearms and will only use them in a pinch before discarding them. Trade-off areas Attack/Effect PL 5, Dodge/Toughness PL 8, Parry/Toughness PL 10, Fort/Will PL 6. Point total 96. Abilities 38, Defences 17, Skills 22, Powers 2, Devices 0, Advantages 17. Equiv. PL 7. 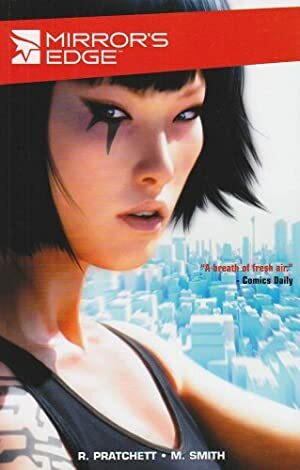 Source of Character: The first Mirror’s Edge video game, and the 2009 comic book (plus the 2008 convention exclusive comic) by Rhianna Pratchett and Matthew Dow Smith. Faith voiced by Jules de Jongh. Helper(s): Coyote’s Own, Peter Piispanen, Darci – and the video walkthrough by one Ghostrobo since I’m just pants at jumping games. Y’en a qu’ont essayé. Ils ont eu des problèmes. Elle est très rapide.